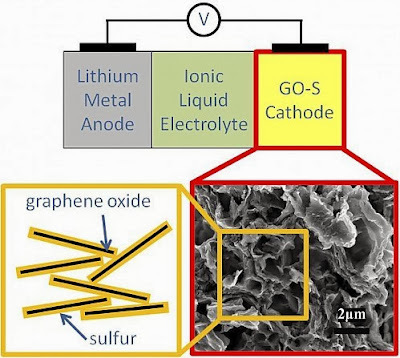 Researchers at the U.S. Department of Energy’s Lawrence Berkeley National Laboratory (Berkeley Lab) have demonstrated in the laboratory a lithium-sulfur (Li/S) battery that has more than twice the specific energy of lithium-ion batteries, and that lasts for more than 1,500 cycles of charge-discharge with minimal decay of the battery’s capacity. This is the longest cycle life reported so far for any lithium-sulfur battery. 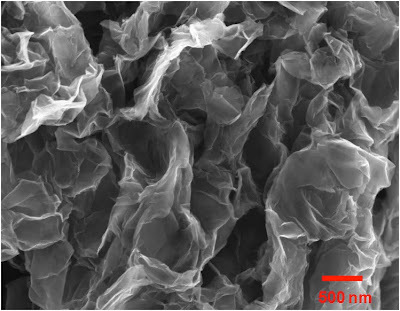 Demand for high-performance batteries for electric and hybrid electric vehicles capable of matching the range and power of the combustion engine encourages scientists to develop new battery chemistries that could deliver more power and energy than lithium-ion batteries, currently the best performing battery chemistry in the marketplace. For electric vehicles to have a 300-mile range, the battery should provide a cell-level specific energy of 350 to 400 Watt-hours/kilogram (Wh/kg). This would require almost double the specific energy (about 200 Wh/kg) of current lithium-ion batteries. The batteries would also need to have at least 1,000, and preferably 1,500 charge-discharge cycles without showing a noticeable power or energy storage capacity loss. “Our cells may provide a substantial opportunity for the development of zero-emission vehicles with a driving range similar to that of gasoline vehicles,” says Elton Cairns, of the Environmental Energy Technologies Division (EETD) at Berkeley Lab. The battery initially showed an estimated cell-specific energy of more than 500 Wh/kg and it maintained it at >300 Wh/kg after 1,000 cycles—much higher than that of currently available lithium-ion cells. The team is now seeking support for the continuing development of the Li/S cell, including higher sulfur utilization, operation under extreme conditions, and scale-up. Partnerships with industry are being sought. The next steps in the development are to further increase the cell energy density, improve cell performance under extreme conditions, and scale up to larger cells. The results were reported in the journal Nano Letters, in a paper authored by Min-Kyu Song (Molecular Foundry, Berkeley Lab), Yuegang Zhang (Suzhou Institute of Nano-Tech and Nano-Bionics, Chinese Academy of Sciences) and Cairns (Environmental Energy Technologies Division, Berkeley Lab). The research was funded by the U.S. Department of Energy’s Office of Science and a University of California Proof of Concept Award. For a more detailed discussion of the technology, see here.